Bearings specialist SKF has summoned Bearing International Holland to court for having sold counterfeit products under its name. The court action represents the latest in a series of moves by the company to crack down on the sale of illegal merchandise, as part of its bid to cut off the circulation of the counterfeit trade. In November 2011, customs authorities in China seized counterfeit SKF bearings on their way to Bearing International Holland. 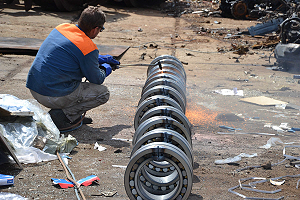 Later, during a raid on a non-authorised distributor in Austria in June 2012, authorities seized counterfeit SKF bearings that were bought from Bearing International Holland. It was at this point that SKF commenced a civil action against the company for infringing its intellectual property rights, which has resulted in the current court action. SKF is urging customers who suspect that they may have taken delivery of counterfeit SKF products to send a photograph and a copy of their invoice to genuine@skf.com.